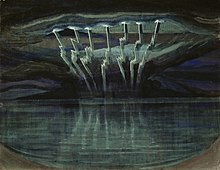 The earliest detector invented to warn of the approach of a thunder storm was the lightning bell. Benjamin Franklin installed one such device in his house. The detector was based on an electrostatic device called the 'electric chimes' invented by Andrew Gordon in 1742. 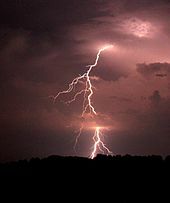 ^ a b c d "NWS Lightning Safety: Understanding Lightning: Thunderstorm Electrification". National Oceanic and Atmospheric Administration. Archived from the original on November 30, 2016. Retrieved November 25, 2016. ^ "Lightning Activity in Singapore". National Environmental Agency. 2002. Archived from the original on 2007-09-27. Retrieved September 24, 2007. ^ a b c Warner, Tom (2017-05-06). "Ground Flashes". ZT Research. Retrieved 2017-11-09. 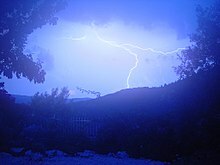 ^ "Lightning's 'NOx-ious' Impact On Pollution, Climate". Science News. Retrieved 4 August 2018. ^ "Surprise! 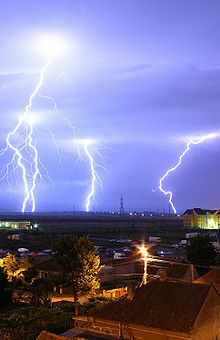 Lightning has big effect on atmospheric chemistry". NASA. Retrieved 4 August 2018. 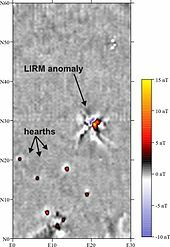 ^ "UNM researchers use lasers to guide lightning". Campus News, The University of New Mexico. January 29, 2001. 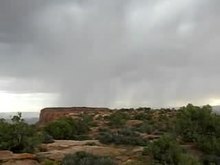 Archived from the original on 2012-07-09. Retrieved July 28, 2007. 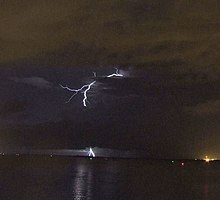 ^ "High-speed solar winds increase lightning strikes on Earth". Iop.org. 2014-05-15. Retrieved 2014-05-19.